Acogedor, excelente servicio ... Agradecer la instancia esos días. Excelente trato por parte del personal. El lugar muy aseado. Excelente el servicio de lavandería. 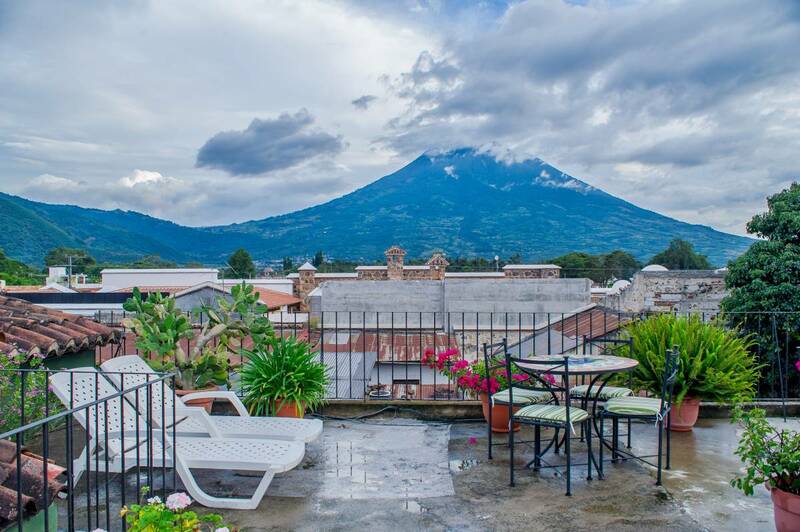 Great location of our budget hotel & hostel - only 1 short block from central park, close to the most important sites and shopping, in a very safe & tranquil location in the heart of Antigua Guatemala. The hotel is even better now, as we finished a complete remodel of the hotel in June 2018 and added the Hotel Casa Colibri directly across the street, as an annex to Hotel Casa Rustica. Both have the same room styles and all have access to the same facilities. We offer 26 very comfortable & clean rooms within 2 properties next door to each other. So, depending on availability, your room will be at either one of the properties. 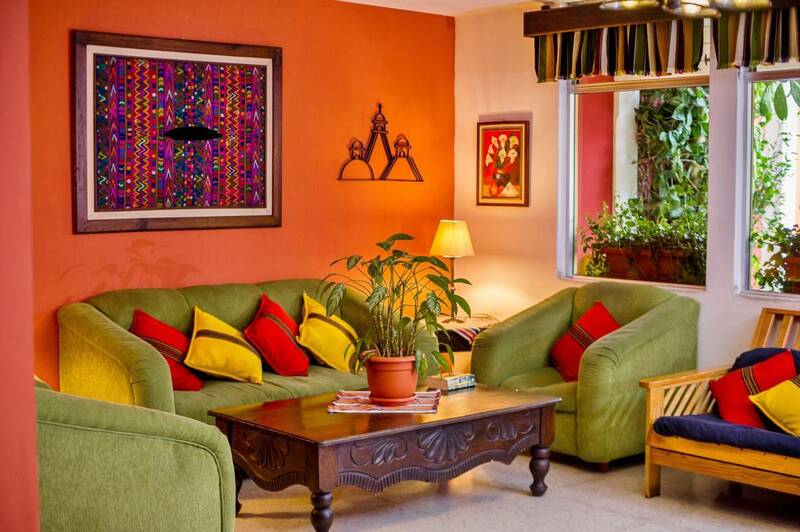 All rooms have beautiful Guatemalan typical furniture & fabrics. All rooms have cable TV, Wi-fi & new anti-stress beds. We have different options for each need, all of them to make your stay pleasant and comfortable. If you are coming with little ones, we offer a pack-n-play baby bed for your use during your stay. There is a real friendly atmosphere and a sense of being at home here. With many common areas in the hotels, you have the opportunity to meet many different & interesting people. Our hotel has 2 friendly & lovely dogs (Lucky and Shirley). Most hotel guest love the hotel dogs and they usually play with them and many guests give them treats. Many of our hotel guests that miss their dogs say that playing with Lucky and Shirley makes their hotel stay even better. If you are not a dog loving person, maybe you would feel more comfortable at one of our other 12 hotel properties in Antigua. 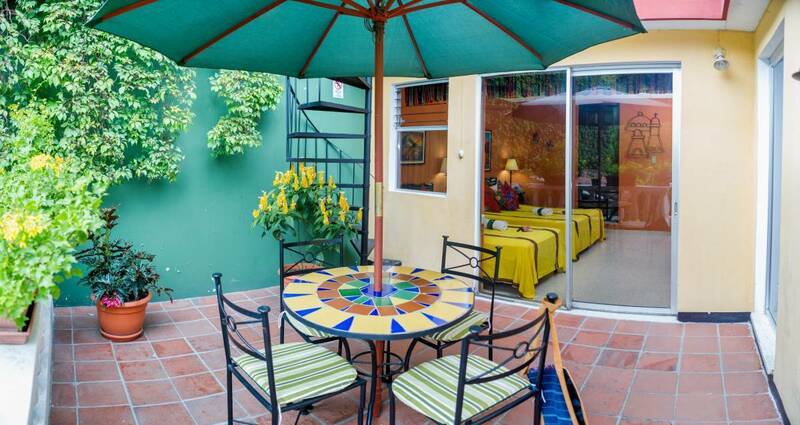 In the Casa Rustica properties group we offer 12 hotels, 1 hostel and 2 sets of vacation rental apartments: Three 4-star hotels (1 with suites, 1 with a swimming pool and spa, and 1 set in the colonial ruins of a historical convent), a four 3. 5-star hotel, three 3-star hotels, three 2. 5-star hotels. All of our hotels are within 4 blocks of each other and within 3 blocks of Antigua's beautiful central park. We have over 225 rooms and can accommodate over 750 people. So, we can accommodate large groups in one single hotel or very large groups between a few of our hotels. 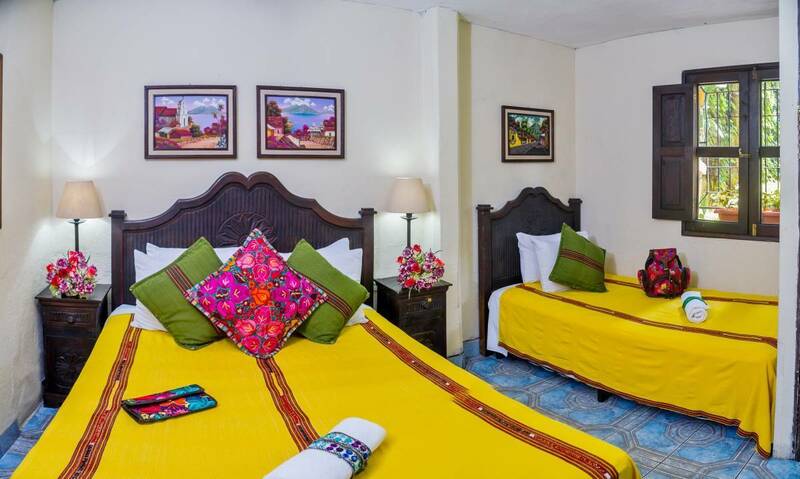 Even if your group is split between a few of our hotels, you would never be more than a 3 minute walk from the rest of your group, since our hotels are very close to each other and very centrally located to the central park of Antigua. Also, if your group is interested in meal plans, we can provide breakfast, lunch and dinner. In Hotel Casa Rustica, we can offer single, double, triple or quad rooms with private or common bathrooms. We offer all private & comfortable rooms, 28 rooms in all. If you are on a budget, we have a hotel room that fits your budget. In Hotel Casa Rustica, we have a Travel Agency, Internet Cafe, Typical store & a small Bar & Cafe in our lobby area with a great selection of coffees, beers, teas & snacks. We also have a billiards table. We have beautiful gardens, a rock garden with a very tranquil fountain surrounded by beautiful flowers & a second garden with a beautiful stone table and benches for a peaceful breakfast or book reading, all surrounded by a palm tree, flowering trees & flowers. We have several hammocks & setting areas located in the very spacious common areas. Also, we have large terraces with spectacular volcano views & more lounging areas. We offer single, double, triple or quad rooms, with private bath & cable TV or the same room types with shared bathrooms & cable TV. Our Quad rooms include 1 double bed & 2 single beds. Our triple rooms have either 1 double bed & 1 single bed or 3 beds. Our double rooms have either 1 double bed or 1 double bed & 1 single bed. 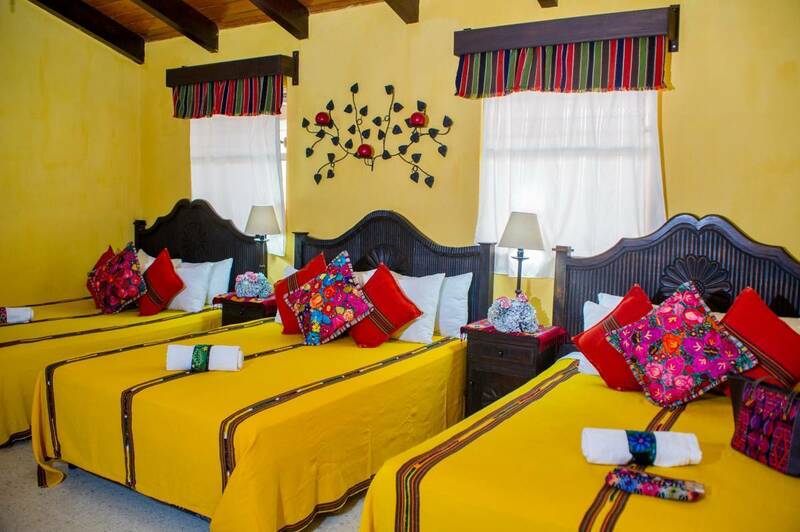 All rooms are private with comfy beds (all anti-stress mattresses), lots of bright Guatemalan colors & lots of light. All rooms have closets for hanging your clothing. All have hand made writing desk & chairs, night stands, head boards, iron forged lamps & windows with lots of natural light. Please read your reservation carefully: When you reserve a private room w/bath, the room is private with the private bathroom in the room. When you reserve only a private room, the room is private with the shared bathroom outside the room. The hotel is located close to all the important sites, 1 block from the central park. With in 1 minute walk, there are historical site, restaurants & shopping. Normal rates for a double room are $39 to $53, depending with shared bath or private bath. High season rates are the weeks of Easter, Christmas & New Years. Breakfast is offered for $6 extra. This needs to be requested 1 day before. If you are planning your own way, from Guatemala City airport, take a shuttle or drive to Antigua (45 minutes) via Calzada Roosevelt. Enter into Antigua, for Hotel Casa Rustica, go 1 block west of the central park to 6th Ave north #8. We offer private airport pickup for $37. This price is for 1 to 3 hotel guest. For larger groups, it is $8 extra per person. To arrange this, please write us an email at casarusticagt@hotmail. Nearest airport: Guatemala City international airport is 40km, we offer airport pickup for $37.